If you haven’t noticed, HoneyTrek.com has become my new labor of love. Seeing Design was meant to be the aesthetic arm of our blog about our 675-day honeymoon around the world, but the style and stories behind each of the 33 countries and 302 places we visited can’t be separated from our journey to find them. HoneyTrek chronicles the twists and turns of our unconventional path and everything that inspired us along the way. Stunning architecture, charming homes, chic designs, talented artisans, exotic cuisine…these tenets of SeeingDesign can all be found over on HoneyTrek…but within a context that means so much more than what meets the eye. We couldn’t be more proud of HoneyTrek (and all the press it’s been getting!) so we hope you check it out and join us for the adventures to come! If you want to catch up on our past two years of world travel, watch this video, full of highlights from a trip that has truly changed our lives. Sign up for our newsletter to get a dose of weekly inspiration and follow us across social media to catch our most recent adventures. We look forward to hearing from you and having you along for the ride! The mountains and vineyards of Mendoza, Argentina are spectacular but when enjoyed from Entre Cielos Hotel and Spa they become transcendental. Set on a vineyard at the foothills of the Andes, the contemporary property has 15 rooms and the most unique suite I’ve ever stayed in: The Vineyard Loft—a private tree house hovering over acres of pinot noir vines. A tree house architecture firm Baumraum was specially brought in from Germany for the perfect pod and the in-house design team completed the fantasy with sleek and seductive interiors. Newly opened this spring, we were amongst the first couples to nest here. Views down to the vines and out to the Andes (plus, a welcome bottle of wine) lured us outside for a little terrace time. Here, the view from the Vineyard Loft to the main hotel, designed by Argentine Firm A4 Estudio. Each tower is a duplex wrapped in graphic imagery of figs, mushrooms, cherries—and other flavors of full-bodied wines. The patterns can change depending on the season or vision of chief designer Daniela Wager for architecture that never gets old. The next motif on her list? The typography of wine words. Creators of the first traditional hamam in Latin America, Entre Cielos brings the Turkish bath tradition to a new level of decadence and relaxation. Wrapped in flauta towels we basked in the herbal steam room, exfoliated in the Kese shower, soaked up the vinotherapy in our couples wine bath (yes, I said wine bath), and ended in the lounge chairs of the relaxation room nibbling on fruits and nuts. Heaven is an understatement. Not ready to stir from relaxation mode, we went back to our Vineyard Loft for an extra soak in the outdoor bathtub. You can never have too many bubble baths, especially when bubbly is involved. In the morning, the Katharina restaurant hosts a gourmet buffet breakfast. Fruits, cheeses, eggs to order and cappuccinos were served to perfection amidst the chic décor. When we returned for dinner, we nuzzled up by the fire for a special five-course honeymoon meal, complete with Argentine beef, of course. After our bike ride to the neighboring vineyards, we came back to do a little reading by the pool. Love that the front desk has iPads available for guests to use throughout their stay. We were so sad to leave the Vineyard Loft, we had to order breakfast in bed. It is not easy bringing carafes of coffee and poached eggs down a gravel road and up the stairs of a tree house but the staff didn’t even flinch. Aficionados of service and style, Entre Cielos holds up to its heavenly name. 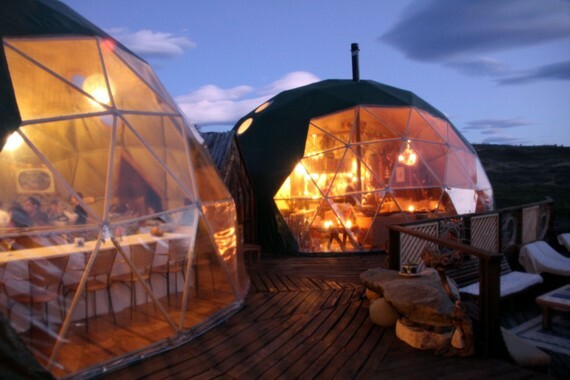 Have you ever stayed at a truly unique property? If so, where? If not, what would you think about a night here? Note: Entre Cielos invited us to stay at the property. Our stay was comped; however, all opinions are our own. Walking through the neighborhoods of Valparaíso, Chile is like a look at centuries of European architecture painted in a rainbow of hues and graffitied everywhere in between. Until the Panama Canal sliced through Latin America in 1914, this central Chilean city was the most important port town on the Pacific–with every powerful country looking to set up shop on its shores. French, Germans, English, you name it, built here in their own style but today the Chileans have reclaimed the “Jewel of the Pacific” with a flair that’s irresistibly its own. Port life is still central to the culture of Valparaíso, with boats pulling in fresh fish for some of the best seafood in Chile. Plaza Sotomayor holds some of the grandest buildings in town including the British-built Queen Victoria Hotel, the American Fire Company, and the Chilean Naval Command Building–quiet the cultural mix. Though originally for the working folk, today’s real heart of the town is the neighborhoods stacked up the hill. There are few funiculars to get people up the hill in a hurry, but the hundreds of staircases are what really connect uptown and downtown. Grand houses like this German-style chalet neighbor with French Mansard mansions, make walking tours (we took a great one with “Tours for Tips”) a design feast. Though if we had to pick one signature style, that is pure Valpo, it would have to be these corrugated-metal cuties. The working class would bring this excess shipping material home from the docks to build homes on the cheap. With so many houses made out of scrap metal you would think the city would look like a shanty town but with a bright coat of paint and scalloped trim, it’s resourcefully charming. If you ever stroll by the Valparaíso courthouse, make sure to give this “Lady of Justice” a closer look. As the story goes, when a Frenchman slept with the wife of the Chilean judge, he was expelled from the country. For revenge, the Frenchman sent this statue of a lady with her scales in a knot and sword sloppily at her side, but it wasn’t until decades later when someone recognized the irony of this prominently displayed art. So embarrassed the town didn’t want to admit their naiveté–instead they explained the Lady of Injustice’s presence outside the court as a contrasting reminder of the fairness within. In the early 20th-century, Valparaíso slipped into decline and until the 1990s, drug dealers had their run of even the nicest part of town. This former mansion was looted for its marble floors, gold fixtures and crystal chandeliers. Today safety in the neighborhood has been “mostly” restored but buildings like this serve as a reminder of their rough and tumble times. Graffiti and bad neighborhoods usually go hand-in-hand but Valpo turned these scars on the town into a mark of pride. Instead of cracking down on taggers, the town decided to outshine them instead. They commissioned artists to cover the city’s walls with inspiring and insightful imagery that has stood the test of time (which in graffiti land is a few short months). Now the art goes well beyond the walls–even gutters get glorified like in the mosaic above. Pushing the limits of the canvas, this artist uses stairs to paint a port scene and the storm drain for a its ocean reflection. Walking Tour: Tours for Tips was such fun and so informative—a must do! Unique Eats: Bijoux Restobar does not have a menu but a chef ready to satisfy your every craving. A truly unique dining experience. 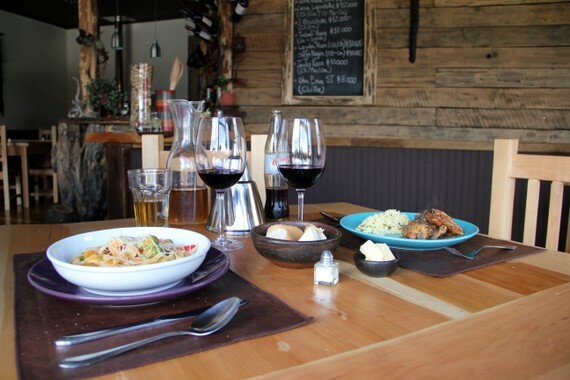 Coffee House: Brighton Cafe is set in a charming cliff-side house for the best views in town. Bar Scene: Sabor Calor is the chic source for creative cocktails. 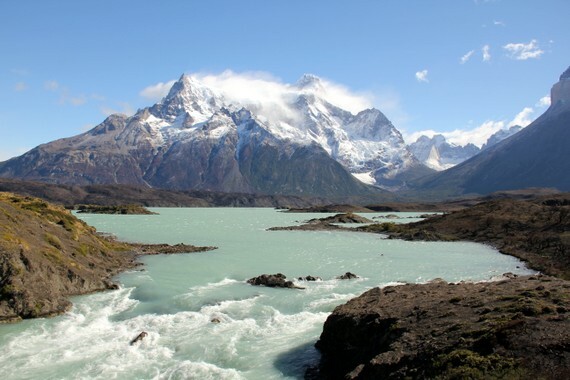 Part of the allure of Patagonia is how difficult it is to navigate. The most extreme and breathtaking landscape doesn’t come right out and present itself, you have to track it down and wrangle it (with a little help from the experts.) 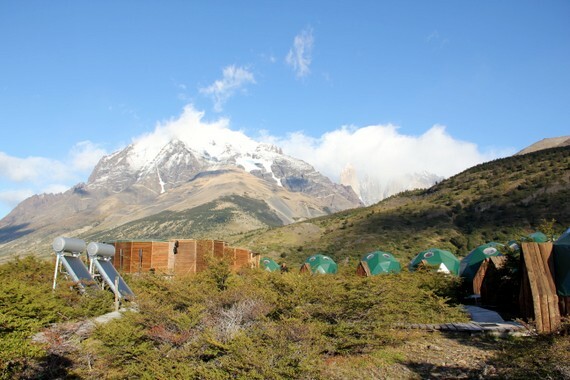 For our trip to Torres del Paine, Chile’s most remote and alluring national park, EcoCamp was just the place to call. Their expert guides and luxurious accommodations turned what seemed like an insurmountable place, into an inviting, indulgent, and invigorating oasis. The five-star treatment started with a pickup at our hotel all the way in El Calafate, Argentina and shepherded across the Chilean border to Puerto Natales. There we were greeted with another chauffeur who dropped us off at the cutest gourmet cafe to regain our strength and get a taste of the incredible wines and meals to come. Our drive to EcoCamp kept our jaws to the floor the entire ride. The huge peaks, teal lakes, Guancos (a cuter version of the llama) and condors prompted us to ask for photo stops at what seemed like every mile. Thank goodness for a patient driver! 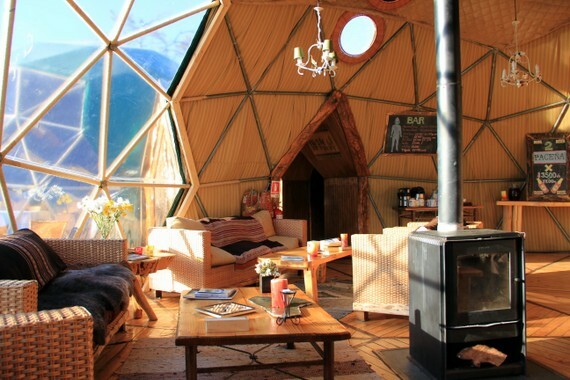 EcoCamp is made of geodesic dome structures—inspired by the strong, agile, and natural homes of a 15th-century nomadic Patagonian tribe. Leaving as little footprint as possible, all amenities are powered by solar and hydro energy and their sophisticated compost system combats nearly all waste created. 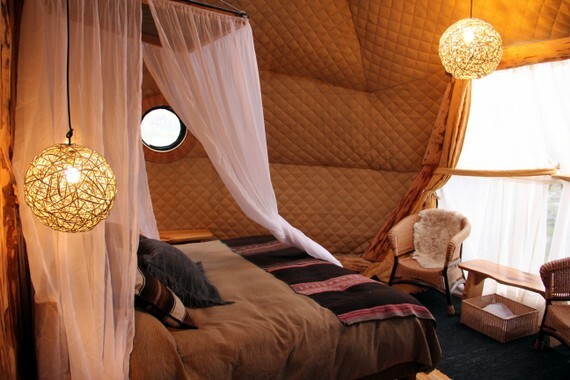 Glamping, as they call EcoCamp’s style of lodging, is a cute way of saying—this is the most sophisticated and glamorous version of camp you can ever imagine. Our honeymoon-worthy Suite Dome had a massive canopy bed with the coziest sheets, a fireplace, and chic lighting to set the mood. 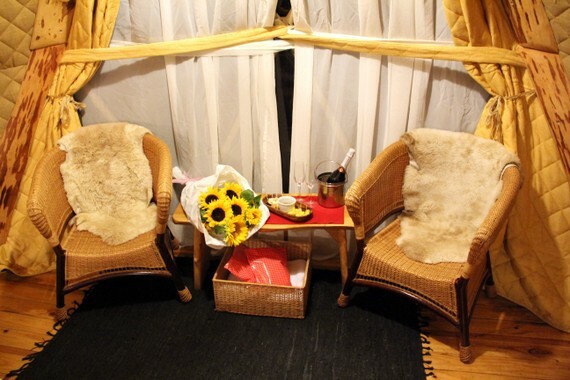 Spoiling their honeymooners, the EcoCamp staff left us a huge bouquet of sunflowers, a bottle of champagne on ice, and wrapped presents of local delicacies (the dulce con leche with nuts was my favorite). 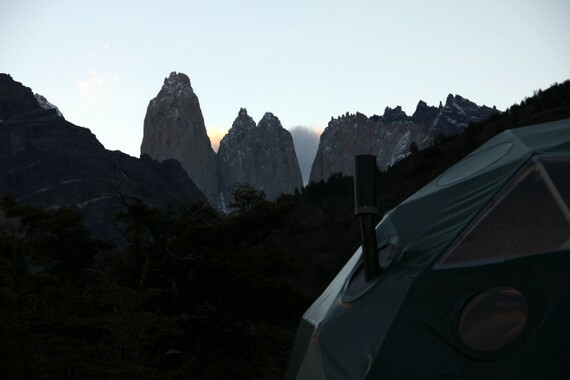 To top it off, our room had the ultimate view: the Torres, the steep rock towers that give the park its name. Unlike most hotels, EcoCamp is all about camaraderie amongst fellow glampers. 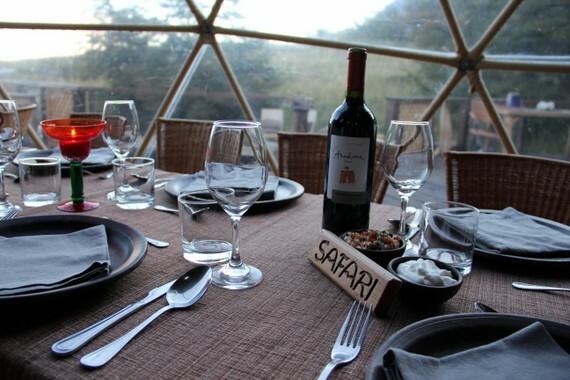 Every night cocktail hour happens in the Core Dome, where everyone gathers for Pisco Sours, a bounty of appetizers (scallops, cheese, olives, meats, the works! ), and to recount stories from their day exploring the park. Connected to the cocktail lounge was a cozy dining room serving beyond delicious meals, complete with Chilean wine (all included in the price of the stay). Quinoa gnocci, butternut squash soup, grilled lamb, were just a few of the treats that kept us salivating. 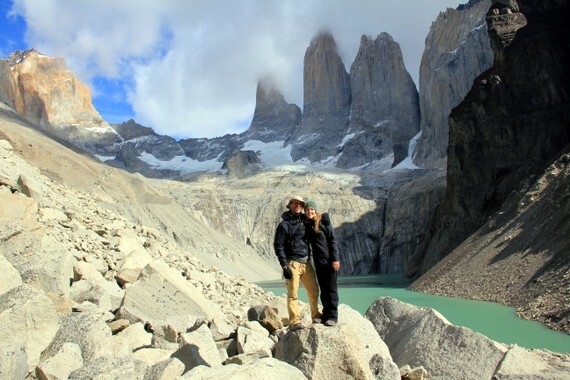 There are infinite adventures to be had in Torres del Paine and your fun, friendly and knowledgeable guide can help make any of them possible. Here is a snapshot of our hike to the Torres but stay tuned for a full dose of the the park’s heart-stopping beauty in Mike’s upcoming blog on HoneyTrek.com. Note: Ecocamp invited us to stay with them. Our accommodations were comped; however, all opinions are our own.